HCM CITY (VNS) — The Ministry of Natural Resources and Environment has urged HCM City to reduce the use of plastic bags to protect the environment. Though much research has been done on non-plastic bags and many businesses have managed to produce environmentally-friendly bags, the use of plastic bags in the city is yet to reduce. According to the HCM City Environment Protection Fund, supermarkets and traditional markets in HCM City consume around 9 million plastic bags a day equivalent to 50-70 tonnes. Ngo Nguyen Ngoc Anh, the fund's deputy director, said it was because of the low price of plastic bags, which cost only VND30,000 ($1.4) per kilogramme. Though the use of the bags has been taxed since 2012 at VND44,000 per kilogramme as part of the Government's efforts to raise environmental awareness and reduce their use by 40 per cent by 2015, the situation has not improved since many businesses evade payment. Makers of environmentally-friendly bags say evasion of the tax is not penalised strictly enough and so there is no great incentive to stop producing plastic bags. 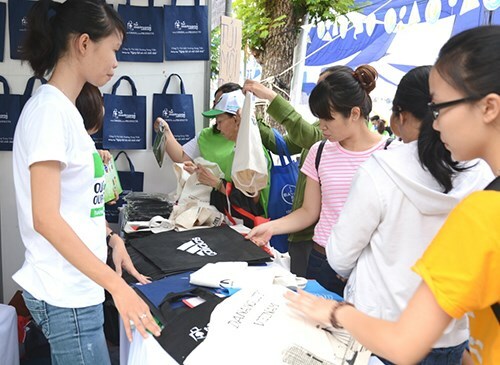 Only 17 companies in the country, 11 of them in HCM City, make environmentally-friendly bags that are bio-degradable and contain approved levels of synthetic materials. And they do not have a large market. Le Sanh My of Vafaco, a joint-stock packaging company based in HCM City, said the company now only sold environmentally-friendly bags to major supermarkets like Co.op Mart and not traditional markets because the product could not compete with cheap plastic bags. Che Van Khanh of Nam Thai Son Import-Export Join-Stock Company, said the price of such bags cannot be cut further because they have to be shipped to Indonesia for testing at a cost of more than $2,000 per sample. Pham Hoang Thuy Nguyen of the Binh Thanh District Department of Natural Resources and Environment, said a pilot project to use the bags at the district's Ba Chieu market showed that besides the price issue, non-plastic bags also have other shortcomings like limited designs, sizes, and varieties. Besides, information about the importance of environmentally-friendly bags is not disseminated sufficiently, especially about how to distinguish between them and plastic bags. As part of a plan approved by Prime Minister Nguyen Tan Dung, by 2020 the use of plastic bags will be reduced by 60 per cent compared to 2010 at supermarkets and trade centres and by 50 per cent at traditional markets. The plan targets collecting and recycling 50 per cent of the plastic bags discarded.